My name is Tyler Dykes, creator of The Show Me Fly Guy blog, and I love fly fishing. I was raised like a lot of other folks. I’ve drowned worms under bobbers for bluegill and thrown beetle spins for bass, but my entire life changed the year my dad got me a fly rod for Christmas. As a recent college grad still living with my parents, I believe he thought the gift might get me out of the house a little more often. This was on the heels of a few trips to Bennett Spring State Park where I was getting pretty handy with a spinning combo and jig. I had seen enough fly fishermen to know that was a big boys’ game and what spin fishermen (in my mind) sometimes aspired to be. So there I was, a newly decorated fly fisherman that didn’t know squat. After checking out books and videos from Mid Continent Public Library, researching the internet for hours, and watching other folks, I had graduated to the level of novice. On my first trip back to Bennett to slay some trout, I caught one. On the next, three. Future trips saw bigger numbers and bigger fish as my learning curve continued, but I was losing my ability to bide my time between trips to Bennett. I wanted to fly fish more on local bodies of water like farm ponds, HOA ponds, and conservation areas. After some time and a little research, I eventually discovered information about fly fishing for warm water species of fish. 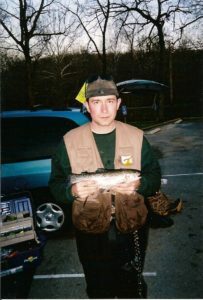 On my first warm water outing, I remember going to a small farm pond that was overrun with 10 inch bass and thinking, “if this trout fishing trick is going to work in warm water, this is a good place to try.” I caught almost a dozen bass that day on a clouser minnow and it was like a veil had been pulled back. “What else can I fly fish for?” ran through my mind. I started stripping wooly buggers for bluegill at Tarsney Lake between Grain Valley and Lone Jack. 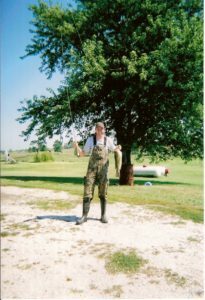 Next, I started throwing big poppers for bass at farm ponds and was lucky enough to catch a 4 pounder that way. That was the first fish that even got into the backing on my reel and I’ll never forget it! Soon, I was getting creative. At a couple of private ponds, I started chumming for catfish and carp, drawing them in close enough to catch on food pellet flies. I couldn’t believe it worked, but felt like I was cheating a little. I took up a new challenge stalking carp from the bank and dropping dry flies in front of them as they fed. To this day, nothing makes my heart skip a beat like a carp sucking down a Griffith’s gnat. 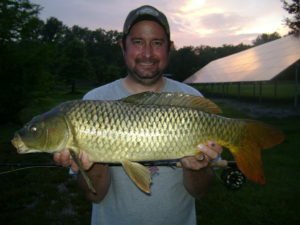 However, one thing rivaling carp on the fly is a phenomenon which occurs on Blue Springs Lake this time of year. 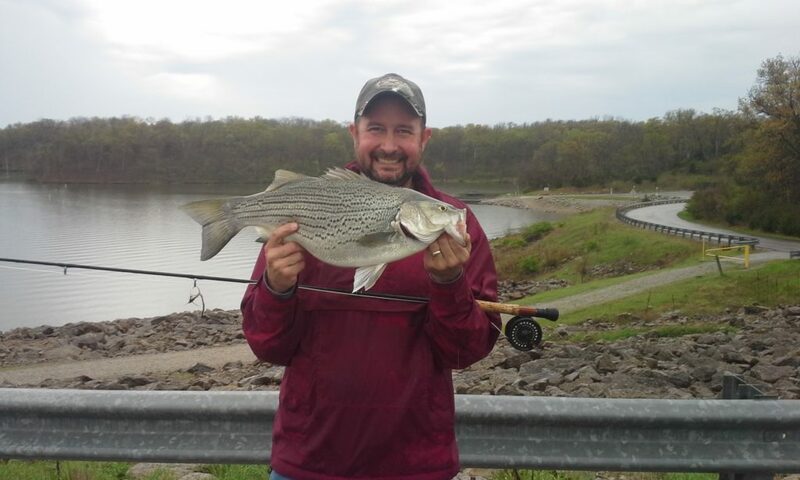 On a whim and a great piece of advice from my buddy, Luke, at the Midwest Drift, I took my eight weight fly rod with a few streamers to Blue Springs Lake dam. It was a calm, cool day with drizzle falling straight down. We saw fish working over schools of shad, but they seemed too far out of casting distance. Just as we were about to give up, I hooked a fish that ran the distance of a football field in a matter of seconds. After a long fight left the fish and I both exhausted, the tale of the tape showed the hybrid bass was 24 inches and eight pounds. That fish hangs on my wall to this day. At the time, it was the only wiper caught on a fly that the taxidermist ever mounted. Now that’s where this fly fishing story could end, but I feel like it’s only getting started. There are still A LOT of things I want to accomplish with a fly rod in the Lee’s Summit Area. I want to catch a walleye out of Lake Jacomo or Longview Lake, a gar out of the Little Blue River, and a 12 pound wiper out of Blue Springs Lake – all on a fly. And finally, I want to land a big bass out of Legacy Lake that I have tangled with before. I’ve hooked her twice, and she broke my heart both times. Now before you head to Rainbow Fly Shop or Bass Pro to pick up a fly rod outfit, be forewarned: fly fishing is challenging. It is purposefully taking a difficult thing (catching a fish) and making it more difficult. Learning to cast can be difficult at times and there are multiple knots to learn. Fly presentation is important and there are multiple ways to retrieve a fly as well as set a hook. Sure, you could use live bait and catch more fish (no offense to bait fishermen, I still bait fish from time to time), but there just seems to be a romance and more satisfying reward when landing a fish on a fly. Just wait until you catch a fish on a fly you tied yourself. To me, I also feel more connected to fish when using lighter tackle. You can feel each head shake and movement with more sensitive equipment and I LOVE that! If you have read this much and you still have the desire to take on all the challenges that come along with fly fishing, then welcome to the brotherhood, or sisterhood if you’re a lady. You know what, welcome to the family. And why not learn to fly fish? It will only add to your overall skill set as an angler and make you a better fisherman. But you might be wondering where to start. I cannot recommend local knowledge and info enough. Fly shops like Rainbow Fly Shop in Independence, Missouri, are a great place to start and have better prices than Bass Pro. Also, the internet is your friend, so use it. Websites like YouTube, Frankenfly, Moldy Chum, The Fiberglass Manifesto, Field & Stream, The Midwest Drift, and Fly Fish KC are great resources. I would be remiss if I didn’t mention my own site, which is called The Show Me Fly Guy. It has become a passion of mine and there are all kinds of resources for novices to the more advanced. I don’t make any money off it, but the views and feedback make it all worth it. Learning to fly fish and tie flies is like discovering a new world…a world that I love and hope you do too! Tyler Dykes is known as the “Show Me Fly Guy”. He’s a middle school teacher who is happy to share what he’s learned with anyone who wants to catch fish on the fly! Find him at his website “The Show Me Fly Guy“. 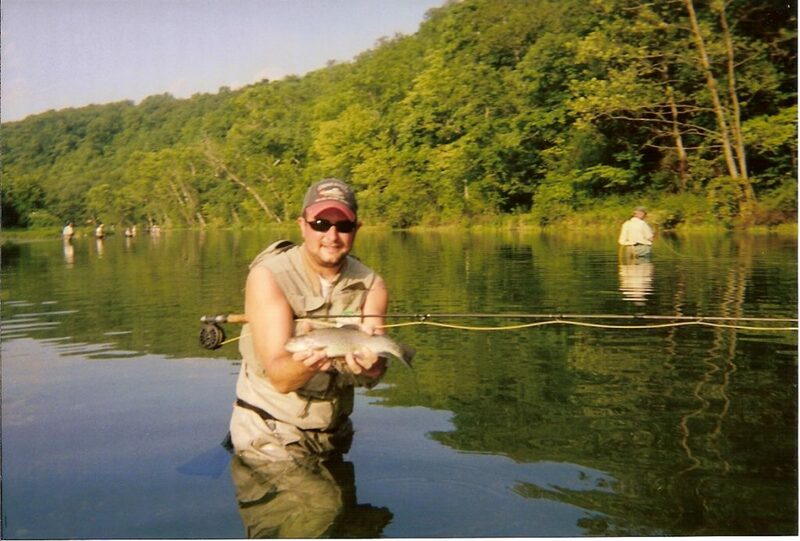 Fly Fishing, Lee's Summit Area Fishing, Missouri, The Show Me Fly Guy, Tyler Dykes. Bookmark.